To say I got off on the wrong foot with Radiohead is an understatement. When I discovered this web site back in 2006 I noticed that the band was considered to be in the progressive camp so I figured it was high time I gave them a listen. I'd heard of them, of course, but I'd never gone out of my way to lend an ear to their music because for all I knew they were a bunch of grunge-inspired punks trying to emulate Kurt Cobain like hundreds of others did in the 90s. Some of the prog reviewers I respected had good things to say about them, though, so I ordered the heralded "OK Computer" CD and popped it into the player. I couldn't stand it and still can't. Way too loose and un-cohesive. That experience put me off them for years until I unintentionally came into possession of their other offerings and I decided to give them another chance to impress me. I was delighted to find that both "Pablo Honey" and "The Bends" were not only listenable but quite enjoyable. What intrigued me most was the fact that Radiohead sounded different on every album, a rarity in today's music scene. But the best of their recordings I've come across so far is their fourth release, "Kid A." It's so unlike their other discs it could be another band's work altogether and I'm all about variety and risk taking in my prog preferences. They open with the brilliant "Everything in its Right Place" that sports an unexpectedly mellow atmosphere that caught me off guard. The song feels like it's building up to some kind of explosive peak but it never climaxes and, in a strange way, I find that wickedly cool. "Kid A" is next and by now I realized that this album was turning out to be much more electronic oriented than what I'd heard coming from the group before. They were definitely burning some popular bridges this time around and exploring fresh avenues of expression. What Thom Yorke does with his voice on this cut is inventive and cutting edge. "The National Anthem" follows and it has a stronger bass and drum presence that raises the energy quotient substantially. It's very psychedelic in an early Pink Floyd motif but it's the horn melee that's the biggest and most pleasant surprise in the piece. Reminds me of what made King Crimson's underrated "Lizard" LP such a fun trip. A highlight track is "How to Disappear Completely." A lightly-strummed acoustic guitar and a wandering bass line set up the tune's melancholy mood but it's no downer. The band erects a beautiful aura around Thom's emotional vocal delivery without allowing the whole thing to become sappy. Kudos to Jonny Greenwood for his excellent orchestral score. It's delicious. I also savored the instrumental, "Treefingers." Its deep, encompassing soundscape is liquid and mesmerizing. On "Optimistic" they really go off the reservation, especially in their approach to establishing the unusual rhythmic foundation and the subtle guitar tones they incorporate. Overall the compositional structure of the song is downright fascinating. "In Limbo" projects a stringy, fibrous texture that swirls around Yorke's unconventional melody. What I like most is how the tune dissolves into a thick soup of chaos in the end. To hell with finesse. "Idioteque" is the runt of the litter. All along I suspected they'd venture into Techno territory as they do here but I can't say I'm all that inspired with what their excursion yielded. For once they were too predictable. "Morning Bell" is a step up. Its proggier 5/4 time signature grabbed my attention immediately and I appreciate their taking a jazzier path at this juncture. Glad to hear they ain't skeered to bring foreign elements into the proceedings, too. They end on a very classy note with "Motion Picture Soundtrack." Pump organs are the nazz so I was drawn into this song's intro without hesitation. The track eventually evolves into a lush, purposely-overproduced extravaganza that I consider an extraordinarily courageous experiment that succeeded on every level. "Genchildren" is a short but not out of place aural epilogue that fits in perfectly. I now understand why Radiohead is so revered in the music world. It's not often that one comes across a well-known group this bold and willing to depart from what their fans are anticipating they will produce next. I'd say they're not comfortable to stay in their comfort zone but, after hearing four of their CDs, I don't think they ever had one to begin with. 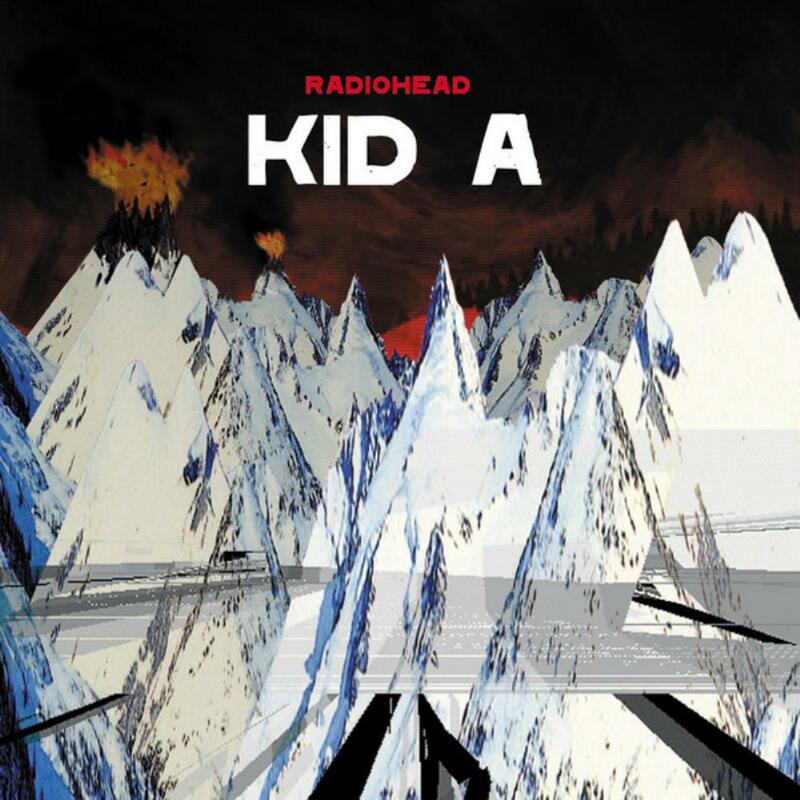 "Kid A" debuted at the number one spot on both the US and UK album charts when it was released on October 2, 2000 and to date it has sold over four million units. It's nice to know that an entity so brave can be so widely accepted by the public. 4.1 stars.